Scientists from ITER, INVOLCAN and ISOR (Iceland) reveal the importance of the diffuse emission of gases for geothermal energy – ITER – Instituto Tecnológico y de Energías Renovables, S.A.
A recent publication of the scientific international journal Renewable Energy reflects the results of a major study on geochemistry of the diffuse emission of gases in the surface environment of the geothermal field of Reykjanes (Iceland). This publication demonstrates the potential application of the emission of these gases to geothermal exploration, as well as for the monitoring of geothermal systems in production. This has been possible as a result of the scientific collaboration work between the Iceland Geosurvey (ISOR), INVOLCAN and ITER. One of the conclusions of this study evidences that the analysis and evaluation of the spatial distribution of gas concentrations in the atmosphere emitted from the soil, such as the carbon dioxide (CO2) and helium (He), diffuse flows of carbon dioxide (CO2) along with soil temperatures recorded in the surface environment of geothermal systems can provide very important information for promoters of projects related to the development of geothermal energy. The work carried out in Reykjanes reflects, at the same time, that the spatial distributions of these parameters of geochemical anomalies are very similar. Besides, this research highlights the existence of a very good spatial correlation between the location of these parameters of geochemical anomalies and the location of wells linked to productive geothermal aquifers. For the scientific team ISOR-INVOLCAN-ITER the similarity which has been observed on the spatial distribution of geochemical anomalies reflects that the study of diffuse flux of carbon dioxide (CO2) in the surface environment of geothermal fields, similar to Reykjanes, is a geochemical tool by itself, very powerful for geothermal exploration. In fact, it confirms that studies of geochemistry of diffuse emission of gases in geothermal systems can provide useful information to define the most suitable locations for drilling or deep drilling for the exploitation of geothermal resources of the subsoil. The results of this work of scientific collaboration reflected in turn that the data obtained from this type of research can also be very useful for the monitoring of the geothermal systems since they allow a quantitative assessment of the extent of variations in the process of degassing of volcanico-geotermales systems in its surface environment as a result of changes in the production of the geothermal field or natural activity linked to the volcanic activity. 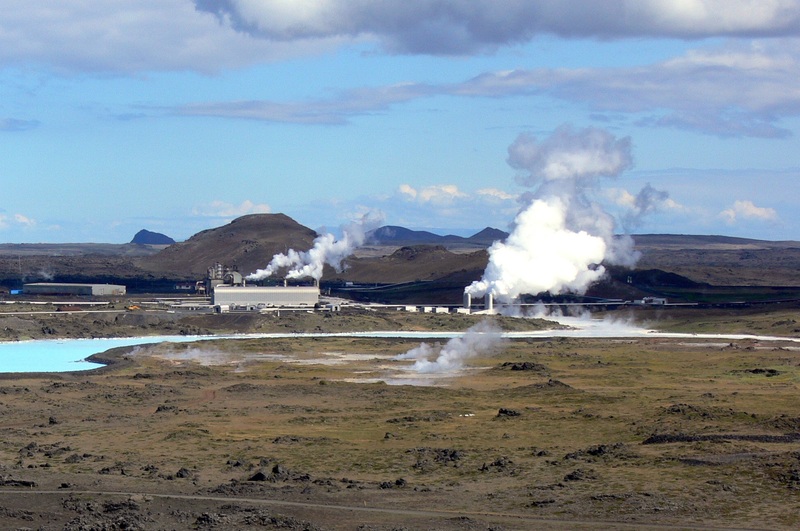 In fact the activity of surface degassing in the geothermal field of Reykjanes soared after sunset on the central 100 MWe Reykjanes geothermal service in 2006. Another objective of this research was to investigate the relationships of CO2 /He in the diffuse and visible emissions of gases in the geothermal field of Reykjanes in order to investigate the use and implementation of this geochemical parameter to evaluate the natural ability of retention or sequestration of carbon dioxide (CO2) from the basaltic substrate existing above the Reykjanes geothermal deposit. We can expect that a process of retention or sequestration of carbon dioxide (CO2 in the basaltic substrate) entail that the relationships CO2 /He on diffuse emissions were relatively lower than those recorded in the emanations of gases visible in the geothermal field. This trend was observed in some of the points of observation but not in its majority. Reykjanes geothermal field lies within the volcanic system of Reykjanes at the South western end of the peninsula of Reykjanes peninsula. It is the westernmost volcanic system of the neo-volcanic western part of Iceland, which is the subaerial continuation of the underwater ridge of Reykjanes. The Reykjanes geothermal field is one of the 20 sets of high geothermal temperature located within the volcanic areas of Iceland.